The oral cavity is a very important organ to maintain the health of the whole body as the entrance of the body and is closely related to health. Since aging of the population is presently progressing, the period when it is possible to live an independent life without requiring nursing care is referred to as the healthy life expectancy, and it is actually differs by approximately 10 years from the mean life expectancy. That is, there is a possibility that you or a member of your family may become bedridden or have dementia for 10 years. Oral health and teeth are deeply involved in this problem. It is known that, if many teeth remain due to preventive actions, the risk of systemic disease is low, the people will be healthy and live a long time and dementia is unlikely to occur. Moreover, aspiration pneumonia is a serious disease, and pneumonia is the third leading cause of death among Japanese people. Since the swallowing function decreases in elderly people, many people may die from aspirating saliva containing bacteria that increased while sleeping. Recent research has also clarified the relationship between periodontal disease and diseases such as diabetes mellitus, cardiac disease, cerebral infarction and premature labor. Caries and periodontal disease, which are the causes of tooth loss and oral trouble, bad breath, aspiration pneumonia and oral candidiasis are frequently caused by bacteria in the oral cavity. 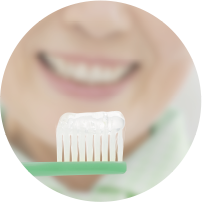 To prevent an increase in the bacteria, not only cleaning by oral care but also moisturization are very important. For elderly people and infants with difficulty to gargle and spit out, pregnant women and lactating mothers who do not want to ingest chemosynthetic substances, and for moisturization, etc. while sleeping when materials may be swallowed, it is necessary to provide oral care with a secure feeling even if the product is absorbed into the body while it is attacking the bacteria in the oral cavity. It is also important to reduce the burden on the caregivers with safe, effective and simple care. For you and the people dearest to you. You can make the future yourselves from today. For your family’s healthy and happy days. For your peace of mind.